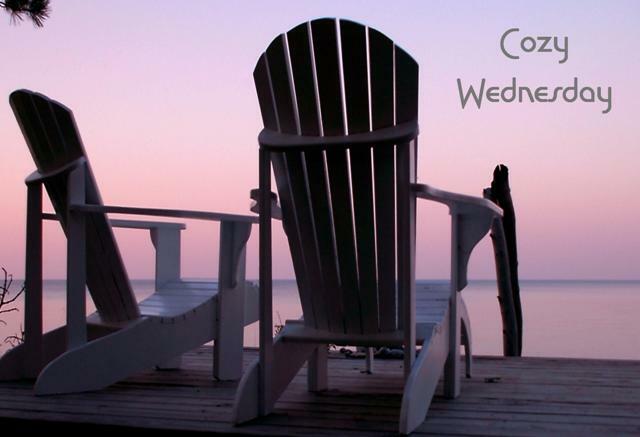 Cozy Wednesday with Janet Bolin – Author of Seven Threadly Sins – Giveaway too! I love when Janet Bolin drops by for visit!! Her new book hits stores May 7 and we are going to tell you all about it today!! For as long as I can remember, I’ve loved putting on costumes and pretending I’m something I’m not. 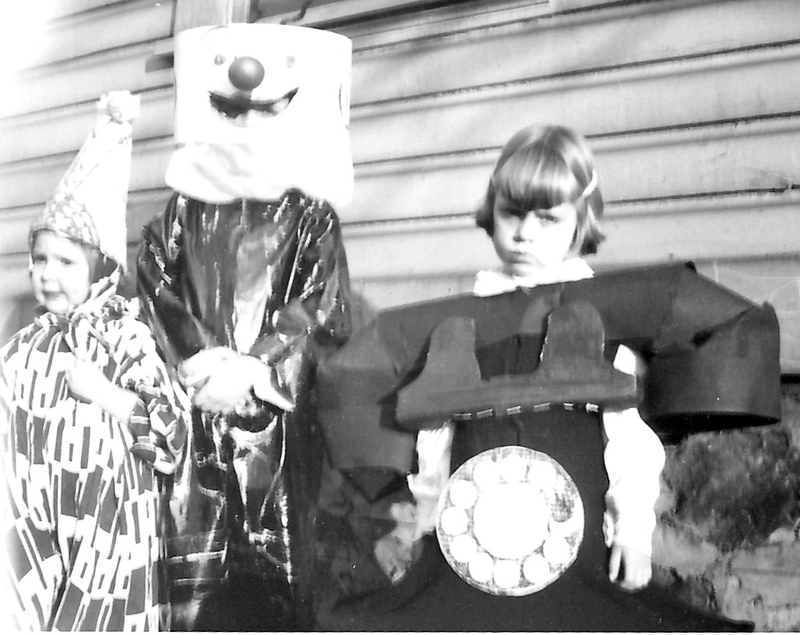 Never mind the pout on the face of the girl wearing the telephone costume: after my cheerful siblings were pulled aside and I had the limelight to myself, I was all smiles. Make believe does not always require costumes. Sometimes, it requires only a pencil and paper. Or a computer and word processor. I created a village where I would want to live, chock full of shops where crafty enthusiasts could buy supplies for sewing, quilting, yarn arts, machine embroidery, and nearly everything else they wanted or needed for making clothes, quilts, home dec, and yes, costumes. The village quickly earned a nickname—Threadville. I filled it with citizens. Most of them are people I would like as friends. Some of them, however, are not quite as pleasant as the others, and are not above committing a little murder and mayhem. My characters (the nice ones, that is) are adept at putting together clothing and quilts, which me ans that they can also fit clues together and help solve murders. I decided they should have the opportunity of solving a mystery related to the sins of fashion. Not surprisingly, my characters fond of wearing costumes and playing make-believe. I would let them be in a fashion show . . .
A few months after I turned in the manuscript for SEVEN THREADLY SINS, my editor sent me a copy of the cover painting—a conservatory with clothes hanging in it and fabrics nearby. 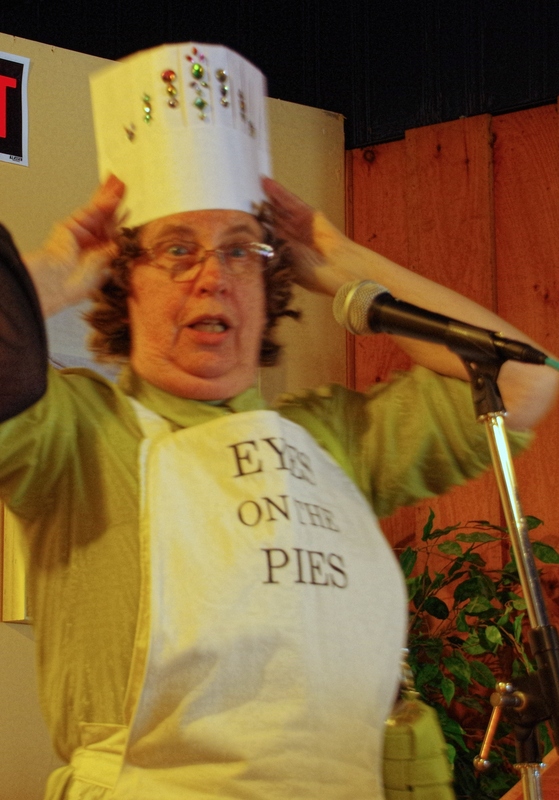 And then I was offered a small part in a mystery dinner theater play, Murder at the Pie Auction. I jumped at the chance. Who knew if I could act, memorize lines, or project my voice beyond the first set of dining tables? I could wear costumes and generally goof around. That was good enough for me. Other than being handed a paper chef’s hat, told I should wear an apron for part of the play, and that the rest of my outfits should be mostly lime green, I was in charge of creating my own costumes. I haunted consignment shops. I made a long apron and used my embroidery machine to put punny sayings on the bib. I decorated the chef’s hat with stick-on “gems.” I found lime green sneakers that suited my character—and my feet–perfectly. There were only two performances. They went rather well, I thought. The audience laughed when we hoped they would, anyway. After having shopped for lime green, I kept seeing it everywhere. And then I needed the cover for SEVEN THREADLY SINS for a blog. I dug out the photo, took one look at it, and burst out laughing. Wouldn’t you know? A couple of the garments hanging in the conservatory, waiting for someone to wear them in the fashion show, are lime green. Don’t you love it when make-believe and real life converge? Janet Bolin’s acting career may be really, really short. In addition to goofing around in costumes, Janet likes sewing, machine embroidery, all sorts of other needlecrafts and handcrafts, reading, writing, and walking with her dogs. SEVEN THREADLY SINS, the fifth book in the Threadville Mystery Series, comes out May 5. Threadville, Pennsylvania, is famous for its fabric, needlecraft, and embroidery, so it’s only natural that it would become the home of the Threadville Academy of Design and Modeling. While Willow Vanderling has certainly never wanted to be a model, here she is, voluntarily strutting her stuff in a charity runway show in outrageous clothing, all to support the Academy’s scholarship fund. But the lascivious, mean-spirited director of the academy, Antonio, is making the fashion show a less-than-fabulous affair. After Antonio plays a shocking prank on Willow and her friends that doesn’t exactly leave the ladies in stitches, he mysteriously winds up dead—and someone is trying to pin the blame on Willow. Time for your yearly trip to Threadville and it sure was a fun escape. Willow and the other Threadville shopkeepers take part in a fashion show hosted by Antonio of the Threadville Academy of Design and Modeling. He was quite a jerk and I wasn’t surprised he ended up dead, but Willow doing him in, no way. Willow and her friends work hard to stitch together the clues and make sure the right person is pinned for his death. As usual they put themselves in some precarious situations to sew everything up. Janet Bolin takes us on quite a ride with several twists and turns. She stitches in humor, a bit of romance and jealousy, along with a finely crafted mystery. I should mention that this story was one that gave me a “book hangover”. I started reading and stayed up until I finished it. Just couldn’t put it down. Leave a comment for Janet for 5 Bonus Entries. The book sounds like a fun read. I am looking forward to reading it. thank you for the review and giveaway. Really enjoy this series and looking forward to this one! Thanks for the chance to win. Thanks for the giveaway! It sounds like a great read! I wanted to thank everyone individually, but I’m having computer problems, so–thanks you everyone for your interest and comments! Love the cover. Looks like another one for the list. Thank you, Ann. The artist who does the cover paintings for my books is Robin Moline. I had such fun with your guest post. Took me back a ways. When I was young we had over 40 kids in our neighborhood. We’d use the clothesline to hang blankets for curtains and do plays. Most were from books, but some we made up. Our parents even got these huge rolls of old theatre ticket stubs and it made it so exciting. We spent many a day out in the back yard sparking our imaginations! Laura, forty kids! What fun! I would have loved to have seen or been in those plays! If it gave you a book hangover, it must be good! It sounds cute! Sorry about the hangover, Dollycas (not really…) Thanks, Christy! A great feature and wonderful giveaway. Janet, you are pretty funny! I like the telephone costume. Very original! One granddaughter one year was dressed up as a Barbie doll, in the box! I don’t have that kind of creativity. I would appreciate everyone else’s talents in Threadville. Thanks for the review, Lori! This is such a fun series. Can’t wait for this next installment! Awww, gee, thanks, Michelle StJames. I hope the hangover won’t be terribly painful. What fun! Thank you. Threadville is a great place to visit AND you would want to live there, as long as you’re not the victim! Oops, Patricia, you noticed that the victims are piling up??? Sounds good, I love your review, I haven’t started this series yet, although it is on my list, it sounds so good I guess that I had better get started. I enjoy this series and look forward to reading Seven Threadly Sins! The cover is beautiful! I love Janet’s series. I really enjoy learning about crafts I haven’t tried yet. Thank you, katheavidreader! I love the cover. Isn’t real life just make believe for most people anyway? That’s a thought-provoking question, Peggy. Ever thought of writing a book about it? Oops, my reply to Katheavidreader went the wrong place–I’m not trying to win my own book, really! Thanks, Katheavidreader! This series is a favorite of mine! Thanks for the great stories and great characters. What a funny post. All that dressing up and singing and generally being goofy was so much fun when we were young – and sometimes now too! And I want to go to Threadville! Sounds like a great story! Thank you. i can’t wait to go back and visit in Threadville! Book hangovers can be a good thing—for starters, it tells me this is a book I must read. Thanks for the review. congrats & continued success to Janet, who was one of the first authors I met at Malice Domestic back in 2011……. Congratulations on your upcoming release! Seven Threadly Sins sounds like a great mystery. The mystery dinner theater sounded like a fun experience. Thanks for sharing. I love this series. Can’t put it down.